Summary: Dry, sarcastic, sixteen-year-old Cam Cooper has spent the last seven years in and out hospitals. The last thing she wants to do in the short life she has left is move 1,500 miles away to Promise, Maine - a place known for the miraculous events that occur there. But it's undeniable that strange things happen in Promise: everlasting sunsets; purple dandelions; flamingos in the frigid Atlantic; an elusive boy named Asher; and finally, a mysterious envelope containing a list of things for Cam to do before she dies. 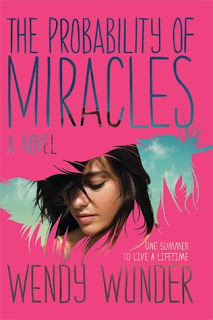 As Cam checks each item off the list, she finally learns to believe - in love, in herself, and even in miracles. My Thoughts: When I started The Probability of Miracles, I knew it had to be good. I had heard such raving reviews, and it’s a romance and sad novel. I figured I'd love it. I did like it a lot but didn't love love love it like I had hoped. We meet Cam who has the big C. She's been fighting it for the past 7 years. She has good days and bad days. She lives with her little sister and her mother. Cam is sarcastic and witty. She can be funny but it doesn't come off in that funny way. When her family drags her to Promise, Maine because it is the land of miracles, she is reluctant to go at first but figures, its worth a shot. Nothing else has helped her. What’s she got to lose at this point? The family ends up at a lobster barn where she meets Asher. She asks to adopt a lobster. I knew right from that minute I was going to love Asher and this novel would feature some pretty sweet romance. Cam's family ends up staying in Promise and things start to happen. Her life seems to improve and she starts to get better. She starts a whirlwind romance with Asher and things are going great. This book was so neat. It featured lobsters, pink flamingos, dandelions, and family drama. She made new friends, and actually started to realize she must live in the present and enjoy her time. Even though I really liked this novel, it wasn't all about getting better. There were sad times, which made me want to cry. I felt so sorry for Cam and her situation. The Probability of Miracles was such an interesting heartbreaking read. It will have you laughing at times, crying at times, and the next minute wanting your own Asher. The Probability of Miracles is a very realistic novel. You will feel like your in Cam’s shoes the entire time seeing the world from her eyes. Overall: I really enjoyed this debut. It was heartbreaking, beautiful, and great. I loved the envelope Cam got from her best friend that told her things to do. I loved watching her cross them out. I loved her relationship with her family and Cam. I loved the way she saw the town. All in all, even though this novel might break your heart at times, you’ll want to read it anyway. Cover: Love it! Love the pink and the way the cover looks like a feather. Very pretty cover. I enjoyed this very much! It's definitely heartbreaking. I know I cried while reading the end, and it's rare that a book can make me cry. That made it a must buy for me. I'm glad you enjoyed it Cindy, even if you didn't love it! Sounds pretty good! I always get anxious reading books where the MC starts out already with major problems. It's not that I need a HEA, but sometimes I have trouble with the line between heartbreaking and depressing.